There’s bad news and there’s good news in this post. The bad news is proteins from your own body accidentally smuggle radioactive metals into you. The good news is that those proteins can make those materials glow. Do you know how the periodic table has that unconnected band of elements that kind of floats below the main table? The lower row of that band contains all the actinides. The group includes the famous radioactive elements like plutonium and uranium, as well as slightly-less-famous ones like curium and einsteinium. The actinides share certain properties—they are all radioactive, they can all form several different ions because they can lose multiple electrons, they’re diagmagnetic, which means they’re attracted to magnetic fields, and they’re pyrophoric, which means they have a tendency to spontaneously burst into flames when exposed to air or water. Unfortunately for us, researchers at Berkeley have found that they’re all elements that can get smuggled into our body by a protein called siderocalin, which mistakes them for iron. That means that, when we’re exposed to radioactive materials, this protein makes them a part of our cells instead of flushing them out. Fortunately, the researchers are working on ways to flush out the material, and a pill for that purpose might go into testing soon. But the group also found something cool. The materials can produce luminescence when exposed to, for example, uv light. The protein, siderocalin, seems to sensitize and amplify that response. Our own bodies might produce something that makes these substances glow. 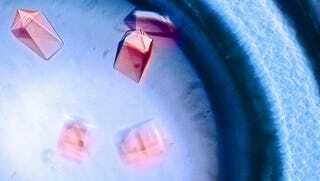 The image above, provided Lawrence Berkeley National Laboratory, shows crystals of curium giving off bright red light. The scientists hope that this luminescence might help in “diagnostics or bioimaging.” For now, it just looks cool.